As Sani (my driver) approached the palace of the Shehu of Borno in Budum community, the road blocks, the crowded streets and the thickening clouds of chaos and confusion signaled that something was wrong. A bomb blast that went off beside Budum market, injuring three soldiers, had invited ruthless military action and reprisal attacks from JTF soldiers. The JTF onslaught left boldly disconsolate imprints that resonated loudly in nearly every home, in every street, and every corner, within the community. Grumbling men, wailing women, unrestrained children and incensed youths milled through the streets, especially close to the smoldering shops and wares strewn in and around what used to be Budum Market. Inestimable quantity of grains of burnt rice, beans, millets, corn, groundnuts, carrots, broken plates, clothing, provisions, drugs and a variety of items littered the entire market area. A handful of local youth rummaged through the ruins, picking objects that caught their fancy. My camera started rolling immediately. A group of women who had lost their entire wares in the inferno, clustered behind the market, wailing and discussing in hushed tones. On particular woman that recently stocked her shop wept uncontrollably as she stared blankly at the destroyed porcelain wares, pots, cooking stoves, cutleries and charred remains of her goods. There, I learnt that the JTF had set the shops ablaze, retaliating the injury inflicted on three of their men when an improvised explosive device suspected to have been planted by members of the Boko Haram sect exploded beside a security checkpoint. Most of the women could not speak English and stared at me with intense suspicion. A young lady, that later became my friend, volunteered to take the spot the bomb explosion took place. Engaging local communities is a past time I have always cherished, and the uneasy calm within the community required that I brought my community engagement skills to bear. Before filming the explosion site and adjoining shops that caved in during the blasts, I introduced myself to a small crowd of local youths who were loudly remonstrating the military invasion and the killings that followed. Within minutes, the crowd swelled as I began to address them. Luckily, one of them, Alhaji Kaigama (who I think is between 24-26 years) assumed the role of my interpreter. Seeing the absolute dedication and diligence with which he interpreted my address, my fears began to wane. During that roadside engagement, I listened to tons of several, fairly uniform eye witness accounts of the military action. According to eyewitnesses, trucks filled with soldiers surrounded the community minutes after the blast and wreaked havoc on every human or object in sight. The owner of the shop (where the bomb exploded) was sprayed with bullets. In that vicious fury, jars filled with fuel were flung into shops stocked with goods and wares: In total, 42 shops and six cars parked in various locations were set ablaze. Shop owners and buyers alike ran helter skelter: there was no time to salvage anything at all from the burning shops. Soldiers shot directly at fleeing shop owners and passersby killing and wounding scores. 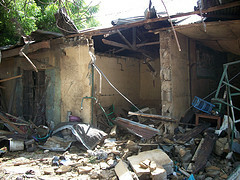 Many were chased into their homes and killed in front of their families and neighbours. Abandoning the wounded and severely-injured, and offering them no form of medical assistance, the soldiers allegedly took some corpses away to undisclosed locations. To ascertain the actual death toll, and corroborate the diverse accounts shared by eyewitnesses, I requested see the graves of the deceased; speak with their family members, and or see some of the wounded to document their own testimonies. Gladly, Kaigama and many others offered to take me round to see things for myself. A fidau (funeral service) prayer was going on when we got to the home of late Mallam Goni Tijani, who was allegedly shot in his home by JTF soldiers. I sat down on the mat and joined the prayers. Being the only woman seated among several men, I suddenly became the center of attraction. It was also evident that I was a stranger, unfamiliar with the customs and ways of the people. News went round that I was a journalist from CNN that had come to document their story. More people trooped to the venue to get an opportunity to be filmed. Apparently discomfited by my intrusive presence, the Imam stopped the prayers and beckoned on me to speak. Flashing my identity card, I formally introduced myself as a researcher from Lagos interested in documenting their experiences and helping them to tell their stories to the world. The deceased’s elder brother stopped halfway in tears, as he narrated how irate soldiers shot the deceased, leaving behind two wives and 11 children. His two shops were also razed. I was shown round the bullet-riddled home of Mallam Tijani, the broken doors, the smashed windows, expended bullets and the room where he was dragged out from before he was shot right in front of his house. As I inspected the damaged door, a little girl, the deceased’s daughter (aged between 5-7 years old) constantly tucked at my dress as though she had something to say. So, I stooped down to listen to her long narrative in Hausa (I later learned that was Kanuri). There was pin drop silence as she spoke, twiddling with her fingers. Carried away by her narrative, Kaigama forgot I depended on his translation. All of a sudden, pointing two of her middle fingers at me, she made a loud sound…gbaaaaaaa….and then burst into irrepressible tears. She witnessed her father’s murder! She watched the soldiers kill her father!!! I regretted not filming her. So, I pulled out my camera and requested her to retell the story, but her mother suddenly appeared and quickly dragged her away. With that unsolicited, mind-boggling first-hand account by a child, the temperature of the crowd rose to a boiling point. The crowd comprising mainly young males and a few females had tripled, charging, chanting, cursing the soldiers and demanding their exit from Miaduguri. I filmed away. The next port of call was the home of late Babakura Zakariya,18, an okada operator, whose murder was even more gruesome. The deceased’s motorcycle straddled the entrance door leading to the room where a group of women had come to commiserate with his grieving mother. According to Aliyu, his friend who witnessed his murder, Babakura was among the fleeing crowd chased by JTF soldiers. One of the soldiers chased him into his home, dragged him out, and kicked him into a kneeling position. Disregarding his tearful pleas, he was shot thrice: on the head, chest and waist by the soldiers. He died instantly. Babakura’s father sat under a tree with a relative who has also come to commiserate with him. 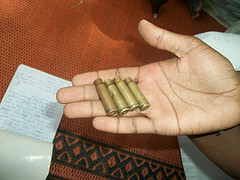 Nearly all the houses near the market were riddled with bullet holes. After listening to the bitter tale of his son’s execution, which sounded similar to his wife’s account, I was led to the Mustapha’s home where another gory killing occurred. In the ensuing pandemonium, a young man ran into his home, and hid in his bedroom. A soldier chased him into the bedroom and shot him on the forehead, splashing his blood on the bedroom wall. Mustapha’s family and properties: mattresses, chairs, kitchen utensils and so forth were all heaped outside, while a painter struggled to repaint the stained portions of the wall. “That boy’s ghost is still hovering in the room. We will remain outside until he leaves”, Mustapha said fretfully. As I went from home to home, it seemed every household had a bitter tale to tell. Almost everybody I talked to had one demand: Tell the Federal Government to withdraw these soldiers from Maiduguri! Comparing the proportion of the damage, the carnage, the material and human losses that followed THE INJURY SUSTAINED BY ONLY THREE SOLDIERS forced tears to my eyes. Just as the terror activities of the dreaded Boko Haram sect, especially the use of IEDs is callous and condemnable; JTF’s counter-terror interventions are even more ruthless, in terms of proportionality and necessity. With the way JTF is carrying on in Maiduguri, it is unlikely that there will ever be peace in that state, and the possibility that communities will ever cooperate with security agencies is almost non-existent. Navigating through the narrow pathway leading to the market, a surging crowd had gathered, patiently waiting for me to listen to their stories of pain, of gloom, and possibly retell them to persons, and institutions who may help them. At that point, I became very frightened by the sheer size of the crowd following me around. It was difficult to tell who was harmless or not. Kaigama’s appeals to them to disperse fell on fell ears. My driver, Sani was nowhere in sight. Overwhelmed by the grief that befell them, most of the residents yearned for a channel to ventilate their grievances and pains. Not even the state governor, the local government chairman, nor any state agency or official had visited the community following the brutish military operations. Then, a man struggled through the crowd and walked up to me. He was the Bulama (village head) of the community. He had learned about my visit and had come to welcome me formally to the community. The way Kaigama and many others greeted him indicated that he was a respected man. Having worked with communities for almost a decade, I recognize the importance of traditional institutions, and the important roles they play in facilitating community engagements. So, I followed him, to his house. And the crowd followed.